Swelling after any surgery is expected. Certain areas of the body are more predisposed to post operative swelling. The ankle is one of these areas for two reasons. Firstly it is very far from the heart and therefore receives less nutrients and oxygen for healing as they have been ‘gobbled up’ along the way. Secondly and more significantly, the foot and ankle are the most dependent part of the body. As a result, gravity drives fluid into the ankle and with little motion after surgery it is very difficult for the fluid (swelling) to be pumped out. Swelling after ankle surgery can be short lived, but in other cases can be present for extended periods of time, even up to one year. Elevation in the early postoperative period is usually very helpful. I hope this helps you better understand the possibility of swelling after an ankle surgery or operation. A common question I get from patients is “What is arthroscopic knee surgery?” That said, here is some information about the procedure, the risks and the success rates. When mechanical knee pain, such as a meniscus tear, persists an arthroscopy of the knee would be indicated. 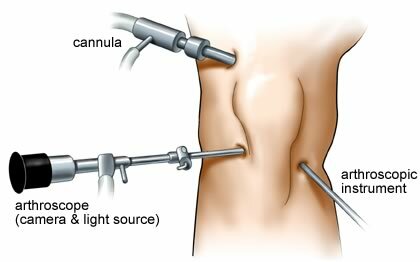 This surgical procedure involves placing a telescope into the knee, which is in turn connected to a camera and monitor. The incisions for this type of surgery are very small. One incision is used for the telescope and one or two others are created for instruments, which are used to correct and deal with the cause of the pain and mechanical symptoms. Overall this is a low risk procedure, but as with any surgery, not risk free. In some patients post operative swelling can linger for weeks. In most cases the success rate is very high and predictable, usually about 90% improvement of preoperative pain, as well as significant improvement in function. Ligament reconstructions can also be done arthroscopically. Loose body removals as well as local treatment for early arthritis as well as focal areas of advanced arthritis can be treated this way as well. Arthroscopy for advanced cases of arthritis has not been very effective. I hope that helps you learn more about arthroscopic knee surgery, its risks and success rates. Often times, my patients experiencing severe hip pain appropriately ask me, “Are there any alternatives to hip replacement surgery?” This is a great questions which requires a meaningful discussion. As many of you know, I believe surgery should only be considered once the alternatives are researched and evaluated. A partial or total hip replacement may be the best solution for some patients. However, there are alternatives that each patient might wish to explore prior to opting for the surgery. Individuals should review the possibilities with their physicians since every case is different. In general, surgery should only be considered if traditional treatments such as medications and physical therapy have not been successful. If the pain is due to a misalignment of the joint known as hip dysplasia, a femoral osteotomy might be a suitable alternative. The procedure requires a patient whose weight-bearing hip area is capable of being broadened. The surgeon cuts the femur to realign it in its proper position. Recovery may be lengthy and is often longer than the recovery following hip replacement surgery. Arthodesis is a procedure to fuse the femur head to the acetabulum. During surgery, a plate is normally screwed into place and some patients will need a cast to immobilize the joint while it heals. Arthrodesis is basically hip fusion, and therefore it eliminates the joint’s ability to move and leaves the patient with a limp. Because the patient’s back will have to compensate for lost hip movement, ideal candidates must not suffer from back pain or immobility. The procedure is not widely performed exempt in younger patients whose livelihoods depend on their ability to perform heavy labor. With hip resurfacing the surgeon inserts a cap on top of the femur. This conserves the bone, and since he does not need to insert a stem into the femur. As the patient’s bone must be of good quality, patients with osteoporosis or similar conditions are not ideal candidates for the procedure. Many patients have been able to return to an active lifestyle, including running, after a hip resurfacing. If the patient has a severe, uncontrollable infection or a physical condition that precludes normal walking, a resection arthroplasty may be performed. In this procedure, the surgeon removes the bone surrounding the hip joint. Scar tissue will eventually fill the space. Almost all patients undergoing the procedure will need to use some type of walking aid on a permanent basis. I hope this helped you better understand hip replacement alternatives. Cervical neck surgery can take many forms and be used to treat a variety of conditions. One of the most common ailments treated by neck surgery is a ruptured or herniated disc. Discs are the fluid-filled “pillows” between the vertebrae. Illness or injury can cause the fluid inside the disc to begin leaking on nearby nerves. To alleviate the pain, the surgeon may perform a microdiscectomy or an open discectomy. A microdiscectomy is less invasive and often performed as an outpatient procedure. An open discectomy is performed in a hospital. With either procedure, the surgeon will remove all or part of the damaged disc. Some patients may choose to have a laminotomy or decompression procedure performed in conjunction with surgery for a ruptured disc. In a laminectomy, the surgeon removes all or part of the covering of the spinal canal known as the lamina. By enlarging the spinal canal, the surgeon can often reduce the pressure exerted on a nerve and alleviate the patient’s pain. A similar procedure, known as a laminectomy, removes not only the lamina but also any portion of the disc that is bulging beyond the vertebrae and any tissue that might be damaged. A cervical disc replacement is a relatively new procedure in which a damaged disc is removed and replaced with a prosthesis. Some insurance companies, however, consider the procedure as experimental and refuse to provide benefits for the surgery. If the patient has vertebrae that are fractured or that slip out of place, the surgeon may recommend a cervical spinal fusion. This normally involves using a bone graft taken from the patient and inserted between two vertebrae to fuse the vertebrae together. The fused vertebrae will move as one, so there is a loss of flexibility in the operative area. A foramenotomy is a procedure often performed to relieve a pinched nerve or a nerve that is being compressed where it exits the spinal canal. The surgeon first makes an incision in the neck and then removes the tissue responsible for the compression. In addition to bulging discs, damaged ligaments and bone spurs can exert pressure on the nerve. If it is necessary to remove all or part of a vertebra and its disc, a surgeon may perform a corpectomy. Most patients who undergo this procedure have spinal canals that have become extremely narrow due to the growth of bone spurs. The surgeon may harvest a bone graft from the patient to reconstruct the area or he may use a metal plate to strengthen and stabilize the area. I hope this helped you learn more about cervical neck surgery! So we are on the same page, knee replacement surgery, or knee arthroplasty, involves the removal of the diseased joint and the insertion of a prosthesis. During the procedure, the bones of the thigh and shin are prepared to accept the artificial joint and any damaged tissue is removed. The ligaments are balanced and alignment corrected. Once the new joint is in position, the surgeon sutures and bandages the incision, the patient is moved to the recovery room and the healing process can begin. In many cases, the patient is immediately asked to move his foot or flex his ankle. Early movement can help increase the flow of blood in the leg and reduce the risk of clots or swelling. The patient may be given blood thinners or placed in compression boots as a precaution against clotting. Most patients begin working with a physical therapist within 24 hours of surgery. The therapist may manipulate the leg to demonstrate exercises that the patient is to perform. Patients who follow instructions and faithfully practice their exercises typically experience the most satisfactory results. Initially, patients will follow a graduated exercise program to regain strength and mobility. They may exercise by walking indoors, moving to outdoor strolls when they achieve a level of comfort with their movements. Going up or down staircases may be avoided at first, and then encouraged as healing progresses. Crutches, walkers and canes may be appropriate at certain points during the healing process and discouraged at a later date. Every patient’s recovery is different, and only his physician can decide the exact nature of his rehabilitation program. Normal light activities, such as walking or shopping, can typically be resumed three to six weeks after surgery. If the patient has enough flexibility in the knee and sufficient muscle control to operate the pedals safely, driving may be resumed in three to six weeks. Although low-impact sports, such as golf or swimming, can likely be resumed once recovery is complete, some patients can return to sports such as tennis or skiing. Since each case is different, however, patients should discuss such limitations with their surgeons. During recovery, patients should protect themselves from falls. A fall can damage or loosen the prosthesis and lead to another surgery to correct the damage. Although physical activity is an important factor in a successful recovery, patients should not push themselves beyond their limits, since counter-productive injuries may result. Every patient is unique, therefore a comprehensive discussion with your surgeon prior to surgery needs to occur to establish expectations and goals. I hope this helps you learn more about knee replacement surgery recovery! A frozen shoulder (adhesive capsulitis) is the result of the body’s attempt to heal damaged tissue. The body does not always regenerate healthy tissue after an injury, and occasionally creates fibrous tissue. Scar tissue is thicker, denser and has less blood supplying than normal tissue. This limits its functionality and most importantly its elasticity. Scar tissue (adhesive capsulitis) in the shoulder can result from previous surgeries and injury (strains) but in some cases there may not be a specific reason . If the lining of the joint becomes inflamed, the body can generate scar tissue to protect itself. This restricts movement and can cause pain. Previous injuries that failed to heal completely can also cause scar tissue to form in the shoulder. Sometimes, the reason for the formation of scar tissue in the shoulder may be related to a medical condition, most commonly diabetes . The first step in treatment is NSAID’s ( advil, aleve, etc.) Physical therapy is crucial in regaining motion. A combination of stretching and strengthening with a large dose of patience can resolve the problem in may instances. Recovery is a slow process and the earlier it begins the easier it is. Intervention is sometimes required if scar tissue is causing the patient problems. Manipulation under anesthesia is a procedure performed while the patient is asleep. It involves forcing the patient’s shoulder to move through a full range of motion. The intent is to stretch the scar tissue or break it up so that the shoulder is free to move. Extensive rehabilitation is typically required following the procedure. Although not a surgical procedure, the patient must be placed under a general anesthetic because of the pain that the manipulation can cause. Often, the surgeon can perform arthroscopy to release the joint capsule or remove the scar tissue. The surgeon will insert a small camera that transmits images to a monitor. Then, using smaller instruments than in traditional surgery, he operates through tiny incisions, using the monitor to guide his movements. On occasion, if the scar tissue is extensive or if the arthroscopy does not achieve the desired results, traditional open surgery may be necessary to remove all damaged tissue. Because scar tissue can result from surgery such as a rotator cuff repair, it is important that patients follow any exercise or physical therapy program the surgeon prescribes. In addition to strength-building activities, the physician will want the patient to perform stretching and range-of-motion exercises. Without proper movement, scar tissue can become excessive or form in the wrong place. This can cause pain and stiffness in the joint that may hinder the patient’s normal activities. After shoulder surgery, holding the formation of scar tissue to a minimum or preventing it from becoming inflexible can be an important part of future joint mobility. What Should Patients Know About Arthroscopic Shoulder Surgery? Arthroscopic surgery, also known as minimally invasive surgery, allows physicians to examine and treat damages to a joint. By using a miniature camera and tools, the surgeon can perform his work through a much smaller incision, reducing scarring, recovery time and pain for the patient. Unlike open shoulder surgery in which the joint and connecting muscle tissue must often be subjected to trauma, arthroscopy allows the surgeon to restrict his work to the area in need of repair. Arthroscopic shoulder surgery can be performed to correct a wide variety of injuries and diseases. One of the most common procedures is to repair a torn rotator cuff. Until recently, many surgeons reserved arthroscopic surgery for only small tears and repaired larger tears with open surgery. Advances in techniques, however, now permit even large tears to be repaired arthroscopically. Results for the procedure so far appear equivalent to traditional open surgery. Arthroscopy is frequently used to repair a dislocated shoulder or other condition that results in instability of the joint. Superior labral anterior to posterior tears (SLAP), are common among athletes whose sports require them to throw, such as baseball pitchers. In the past, a SLAP tear could end a pitcher’s career. New arthroscopic techniques, however, allow a greater percentage of athletes suffering such injuries to return to their sports. Complications resulting from arthroscopic shoulder surgery are rare but possible. Like all surgery, there is a risk of infection. Some patients can develop blood clots or excessive bleeding or swelling. It is also possible for nerves or blood vessels to be damaged during the procedure. Occasionally the surgeon may discover that the problem cannot be adequately corrected through arthroscopic surgery and there may need to perform a traditional open surgery, or a ‘mini’ open procedure. Each patient’s surgery is unique, but most arthroscopic surgeries can be performed on an outpatient basis or with no more than an overnight stay in the hospital. Pain is variable and depends on the type of procedure performed as well on the patient’s pain thresh hold. With smaller procedures (debridements and decompressions) patients can often resume many activities within days of the arthroscopy. With more complex procedures as instability and rotator cuff surgeries, return to activity is much slower. Physical therapy or specific exercises may be ordered to speed the patient’s rehabilitation. I hope that helps you learn more about arthroscopic shoulder surgery.